Robert Temple Summers, II was born on August 13, 1940 in Cleburne, Texas. He began creating figures and animals with bread dough at the age of two, was painting and doing pencil sketches by school age, graduating to oil at the age of nine. Summers has had no formal art training, save a short course in mixing colors at age 15, where he was told a short time later that he had surpassed his instructor and was wasting his time there. He began professionally to explore his God-given talent in 1964. Since that time he has worked in various mediums including; Egg and Acrylic Tempera, Oil, Dry-brush Watercolor, Pastel and Pencil. He is equally talented with wax and clay, currently dividing his time between painting and sculpting. He describes his flat work as "painterly". 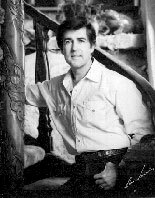 Summers resides in his boyhood home of Glen Rose, Texas with his wife Boo, working with him are two of their three sons. Robert serves as Associate Director of the Creation Evidence Museum and has traveled to Turkey and New Guinea on expeditions in that capacity. Summers plays bagpipes, practices falconry, sings Contemporary Christian music, has played lead rolls in several professional productions and he loves wildlife and the cowboy spirit of the small Texas town.